While you’re smelling the roses of this green oasis in Italy’s capital city, give a thought to what lies beneath. Are Jewish gangs in Rome taking revenge for teens' murder? N.Y. Met presents Ennion, master Roman-era glassmaker: Did he invent branding? Every spring, Rome’s municipal rose garden opens its gates to flower enthusiasts as well as to romantic couples and tourists looking for a quiet corner away from the usual bustle of the Eternal City. Located on the slopes of the Aventine Hill, with a spectacular view of the ruins of Palatine Hill and the rest of city, the Roseto Comunale seems at first glance to be an idyllic site, but a closer look reveals a darker side hiding beneath the sweet-smelling rose bushes. The first clue to the garden’s dark past can be found at the entrance. On the face of a small memorial pillar is a marble plaque of the Ten Commandments in Hebrew. Visitors who are in the know place a pebble or two on the pillar, as if it were the grave of a loved one in a Jewish cemetery. The reason for this becomes clear after learning that underneath the neatly arranged rose beds are the remains of hundreds or perhaps thousands of Jews. 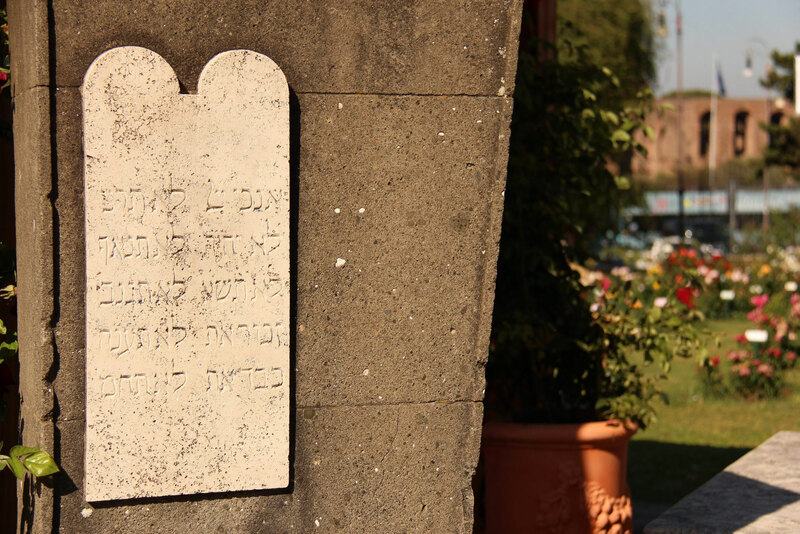 In 1645, Pope Innocent X gave the city’s Jews permission to bury their dead at the site, which became known as “L’Orto degli Ebrei” – the garden of the Jews – and for centuries it served as the community’s cemetery. In 1934, Rome’s fascist authorities decided to build a park and a road through the cemetery, alongside the ruins of the Circus Maximus, for a parade celebrating the 12th anniversary of Benito Mussolini’s rise to power. “Il Duce” had not yet embraced Hitler’s anti-Semitic views; the project was not a direct affront to the Jews, but rather part of the often thoughtless and tyrannical program to reshape the still largely medieval-looking city into a modern capital fit for the new fascist empire, with broad boulevards and parks highlighting the glory of ancient Roman monuments. But while not anti-Semitic in intent, the plan was far from painless for the Jewish community. Authorities had pledged to move all of the remains and gravestones to the Jewish section of Rome’s main Verano cemetery, but in the rush to complete the parade route in time many tombstones were destroyed in place, and entire sections were not excavated. The site was left untouched until after the end of World War II and the fall of fascism. 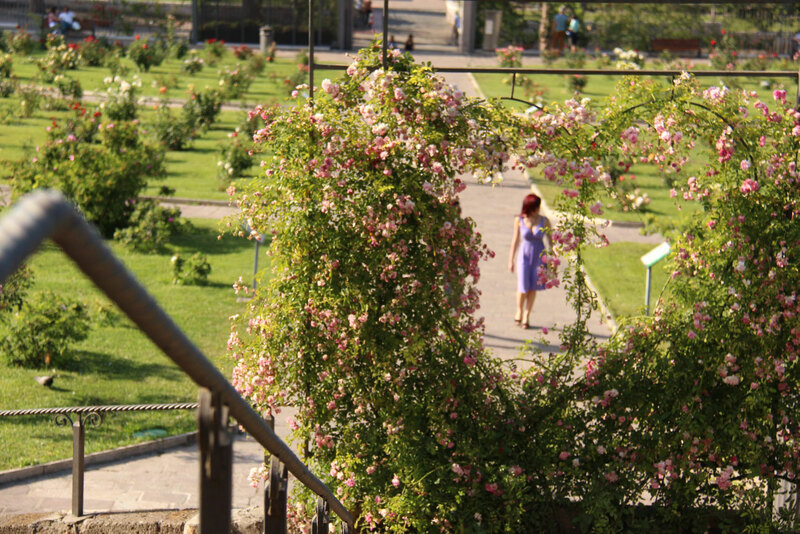 In 1950, with the agreement of the Jewish community, the city created the rose garden. The pillar, with its plaque, was erected in memory of the garden’s Jewish past. In addition, the layout of the paths in the park’s upper section form a menorah, the Jewish seven-branched candelabrum. According to the municipality, thousands of bodies from the old cemetery still lie underground; a sign advises cohanim, descendants of Judaism’s ancient priestly caste, not to enter the site so as not to violate religious prohibitions against contact with the dead. Today, the garden boasts more than 1,100 varieties of roses from around the world and is a top destination for lovers of the fragrant flower. In a way, it is a return to the distant past for the site, which already in ancient Roman times was dedicated to the cult of flowers and the spring goddess Flora. For those wishing to smell the Rome roses, the garden is open only during the spring months, when the flowers are in bloom: This year it closes on June 15.